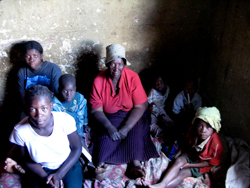 As part of the drive to reach three new countries by 2010, a Hands at Work team visited eastern Zimbabwe in July. Two rural villages were targeted as immediate expansion sites. This grandmother is 75% blind, she doesn't work but earns a little income by renting out her second room. Five of her seven children have passed away leaving her with 16 grandchildren that she now stays with in this one room. She has also taken in one other orphan from the neighborhood. These are the lives we want to touch by beginning work in Zimbabwe.